Nefs are trade ships that were developed by English shipwrights and traders based on the knorr of the Vikings. They were clinker-built like the Viking ships, but with broader hull and a fixed mast. They kept the single square sail. In bow and stern the nefs got raised castles that provided shelter and advantages at fights and raids at sea. The naval actions those days were done by ramming, boarding and hand-to-hand fighting. As with the Viking ships the rudder blade was held by a thick rope on a block that was set on the hull. In its upper part the rudder blade was held in track by a protective beam that prevented damage on ramming or when in harbour. The beam had a removable part to allow for easy changing of damaged rudder blades or lifting in shallow water. In 12th century five towns on the southern coast of England formed the confederation of "Cinque Ports": Dover, Sandwich, Hythe, Romney und Hastings. Later on Winchelsea and Rye joined in. 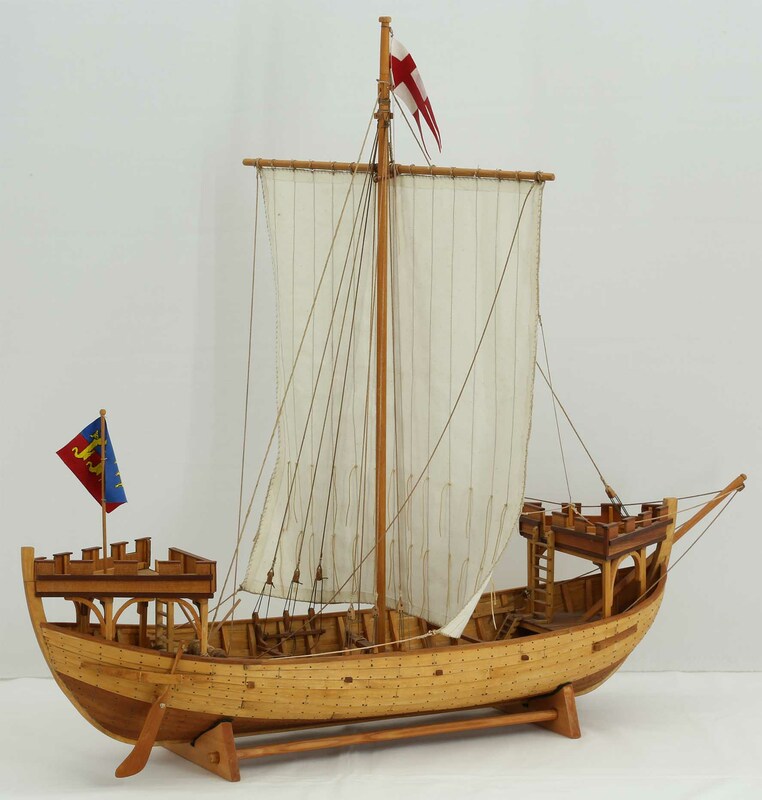 The model shows a nef of Winchelsea that flies the three lions of the seal of Winchelsea at the stern and a pennant with the cross of St. George in the masthead. The ship model was built to plans given in the book by Jochen v. Firks, "Normannenschiffe - Die normannischen Bayeux-Langschiffe und die frühmittelalterliche Nef der Cinque Ports", Verlag Delius, Klasing & Co., Bielefeld 1986, ISBN 3-7688-0549-2. This model of a nef is a fine, detailed and very beautiful piece of work. 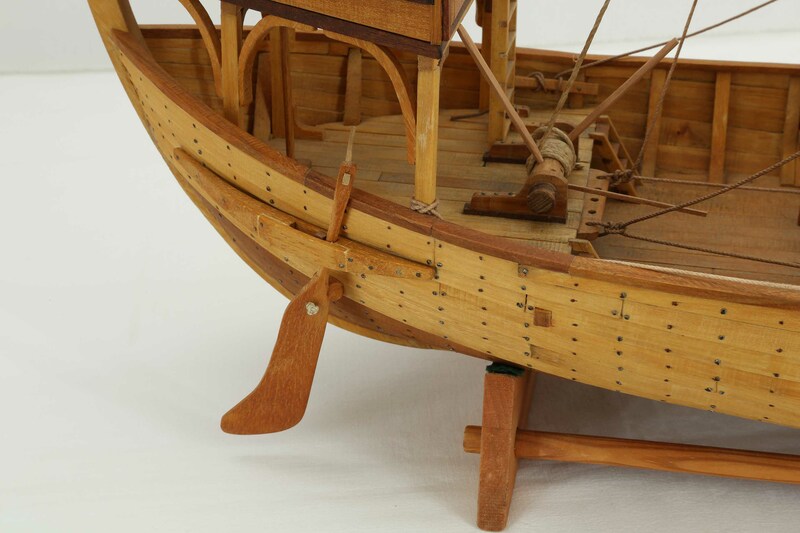 Models of ships of that time are rare. The ship model is 1 : 30 scale. Length is 78 cm, width 36 cm, height 71 cm. 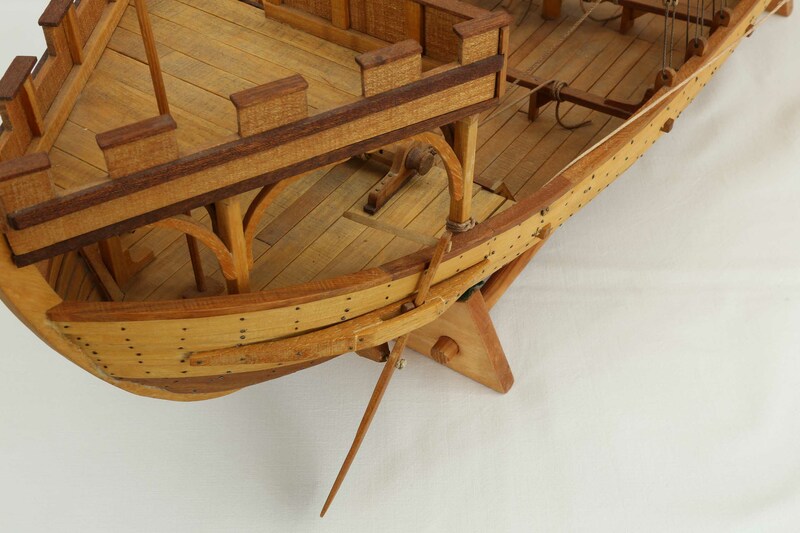 There are more pictures, several views of the entire ship model taken from all directions, and several closer views of hull, deck and rigging. Click images to enlarge!